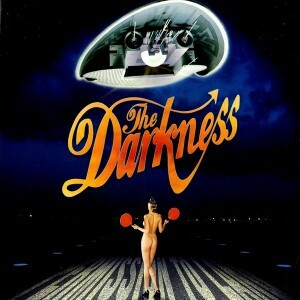 Permission to Land is the over the top debut album by The Darkness that features the flag song and lead single I Believe in a Thing Called Love that they quickly and deservingly became known for. The album throws back to the hard rock sound of the 70’s and 80’s, while overflowing with memorable guitar riffs and solos, audible bass (somewhat of a rarity in rock music), and the outrageous vocal talents of Justin Hawkins. The drums, while not getting as much of the spotlight, provide a solid backing to each song and have a more noticeable presence in the power ballads and during the bridges and breaks of the louder songs. In addition to standard rock instrumentation, there are some incredibly brief and overly subtle uses of a keyboard on Get Your Hands Off My Woman and Holding My Own, a barely audible piano in Friday Night (which also features a low, quiet purring noise) and an acoustic guitar that shimmers on Love is Only a Feeling. Hawkins’ voice stays firmly in the falsetto range for the majority of the album and isn’t afraid to flex his vocal cords to show off his abilities. There are some offbeat moments as well, such as on the albums opener, Black Shuck, in which he alternates between high notes most women couldn’t reach and a snarling tone before jumping back into the style that he has become known for. He later performs a 10 second shriek-slash-gargling noise that sounds like it came straight from the bowels of Hell itself. His voice is pushed right to the limits on Stuck in a Rut (listen from the 2.40 marker) and the lyrics throughout this song (and sometimes others) become incomprehensible amidst his ear piercing performances. In between all of this, he somehow manages to find time to break off to perform a manic laugh that makes you think he’s fallen right out of his tree. As you can judge from some of the song titles alone, lyrical themes revolve largely around love, making love, women, a mythical creature on Black Shuck and probably the most, if not only, upbeat song about using heroin I’ve ever heard (Givin’ Up). With all the catchy, sing along moments and guitar solos combined with the fun loving, lively approach to both composition and performance, this is easily everything you’d want to hear on a rock album and doesn’t fail to deliver on anything.